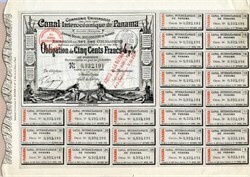 Beautifully engraved Stock certificate from the Bankrupt Canal Interoceanique de Panama Company issued in 1884. This beautiful and historic certificate has wonderful engravings on the document including two maidens, one from North America and one from South America, touching hands with a ship going through the proposed canal. There is also an underprint in the background of North and South America. The certificate has the printed signature of Ferdinand de Lesseps and the hand signatures of company officials. This is an excellent certificate that has 25 unused interest coupons attached. The unused coupons were to clipped off and sent in to be paid from 1889 to 1901, but the company stopped paying interest at the end of 1888. This certificate is over 128 years old and in excellent condition.